Should some secrets be left buried in the past if you want a second chance at love? Helen Tanner runs her own business, spends her evenings out with friends,anything to avoid memories of the tragedy she left behind. She lives alone and likes it that way.Until, that is, a dark-haired vet walks into her shop and into her life. Her first unpromising encounter with Dai Evans turns into a tumultuous affair. As passion grows into love, Helen is forced not only to consider a new future, but to face up to a troubled past.Should she tell her lover what causes her nightmares? Will this family man still want her when he knows the truth? 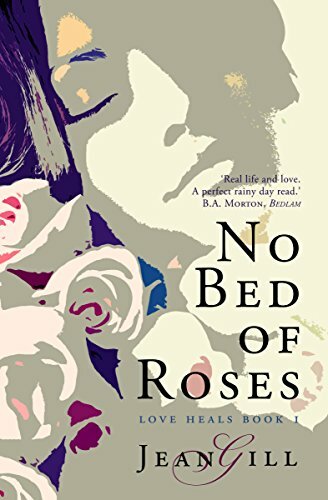 Heart-rending and powerful, No Bed of Roses is a story of loss, love and healing. Jean Gill's characters always feel like real people: complex, thoughtful, and with believable histories and motivation. We really want Helen and Dai to be together and all that stands in their way is the human damage caused by loss and guilt. How can they live with Helen's ghosts? I'm a big fan of Jean Gill's Troubadours series so I was interested to see Jean turn her hand to something outside of the historical fiction genre. As if I could have doubted it, Jean makes the transformation impeccably with deep complex characters that you can't help but care about. Helen lives in a small village in Wales where she runs her own wool shop. When local vet, Dai Evans, walks into her shop one day to buy a present for his wife, the electricity between them is palpable and the pair begin an affair. When Dai splits up with his wife, he thinks Helen will be pleased but she pushes him away. The reader knows that something terrible happened in Helen's past but she hasn't shared this with Dai. When he was married, Helen was quite happy to be the other women and keep Dai at arms length so he doesn't get too close to her, but now that he is free she doesn't seem too keen. Does she not love him or does she think he won't love her if he knows her secrets? In No Bed of Roses, Jean Gill's warm wonderful writing takes on a comforting edge like one of the jumpers her main character, Helen, was knitting. With such a keen sense of place, I felt like I had been swept away to the Welsh Valleys and then to rural France as Dai took Helen to face her demons. Cheating on his wife aside, I loved Dai's loyalty to his family and in return applauded their warm virtual embrace of Helen when she was introduced. I did find the ending a little abrupt but possibly because I wasn't really ready to leave the story. I will certainly be looking out for the next book in the series, More Than One Kind, another novel set in both Wales and France as we follow Helen's friend, Neil, on his teaching exchange.